DEMANDING ROLE: Hannah Levy, who is starring in Happy Days. He might not have been the jolliest of men, but Samuel Beckett didn’t really need to crack jokes. Instead, the Irishman was famed for the unsettling, pitch-black humour of his dramas. Waiting For Godot followed two characters, Vladimir and Estragon, waiting, in vain, for the elusive Godot to arrive. In Krapp’s Last Tape, a lonely man looks back over his life on his 69th birthday. After the latter, Beckett’s wife, the actress Maureen Cusack, suggested he write “a happy play”. The result, Happy Days, might have been created with more than a dash of irony by the late playwright. 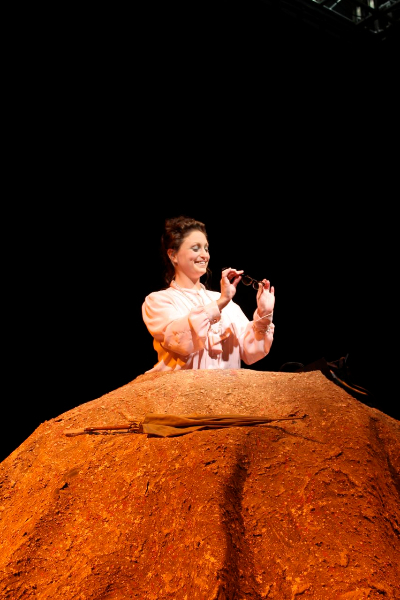 First staged in 1961, it sees one of the characters, Winnie, buried up to her waist in a mound of earth. The other, Willie, offers the occasional mournful observation from the sidelines. For Richard Avery, who is directing a new production of Happy Days, the play is one of Beckett’s greatest achievements. “He was not known for his chuckles,” said Richard, of Beverley theatre company Other Lives Productions. “He was not a man to tell funny stories but, having said that, he puts this wonderful bleak humour into this play. “It is very clever, very sophisticated. The play is being staged at Hull Truck Theatre from tonight until Saturday, starring Hannah Levy, co-founder of Hull theatre company Northern Lights Drama, and Tom Wilders. Hannah’s role, said Richard, is a particularly demanding one – not least for its sheer number of lines. “It is like climbing Mount Everest, it is an extraordinary feat of memory,” he said. Other Lives Productions have previously staged Beckett, having toured a well-received production of Waiting For Godot in 2011. “This is one of my two favourite plays by Beckett,” said Richard. 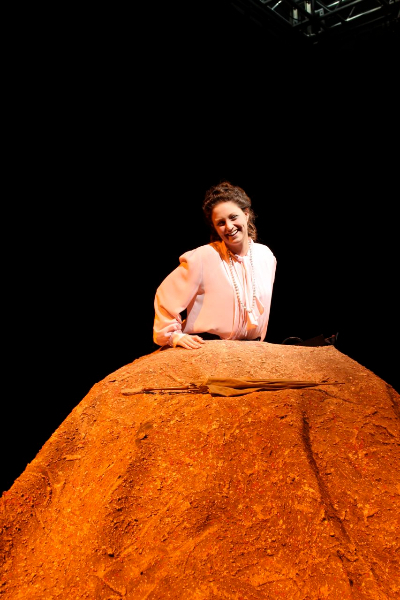 “Waiting For Godot was something I was so proud to have been involved in, and it was such a success for us. “I have always had a hankering to stage Happy Days but I had to find the right person to play Winnie. “I first saw Hannah in a school production and thought ‘My word, she is good’. The production has seen a set, including a naturalistic- looking mound for Winnie, created by stage designer Ed Ullyart. For Richard, this week’s production will remind audiences of the continuing power of the drama, more than 50 years after it made its debut in New York. “It was relevant then, it is relevant now and it will be relevant 50 or 100 years from now – no matter where anybody reads it,” he said. Congratulations to Other Lives Productions on a wonderful run of Happy Days, and to leading lady @HannahLevy88 for a beautiful performance. @HullTruck the fabulous @HannahLevy88 starring as Winnie in Happy Days!! A sensational performance!! Great performance of Beckett’s Happy Days @HullTruck this evening. Excellent acting from a local theatre company.